English and Chinese Dictionary, with the Punti and Mandarin Pronunication. 英華字典. [Ying hua zi dian]. Lobscheid, Rev. W. (1822 - 1893). 4 volumes. 2013pp. Original paper covered boards in English and Chinese with engraved decorative borders and plain cloth spines. Introduction includes: "Table showing the population of China during the various Dynasties from A.D. 2 to 1578, compiled from historical accounts"; an essay on "The Chinese Language" which compares the language with the other Asian languages; "Syllabary of the Canton Dialect"; "Table Shewing the Exact Number of Words in the Canton Dialect"; "Table of Sounds in the Canton Dialect"; Orthography of the Punti or Canton Dialect; "Table of Sounds in the Hakka Dialect"; short section on the Fukien, Hoklo, Amoy and "Mandarin or Court Dialect"; Syllabary of the Mandarin Dialect according to Dr. Williams's System of Orthography"; "The Syllabary of Mr. Wade, with the corresponding orthography adopted by Dr. Williams and Dr. Morrison"; "The Origin of the Written Language". Bindings a little worn, marked or creased in places, scorch mark upper edge of three volumes causing some minor loss on upper margins of some leaves but leaves are generally crisp and clean, corner of three leaves creased, some minor worming lower cover and last leaves, neat repair upper edge of upper cover volume 4. 34 x 24cm. A good set of the first edition in the original binding of a scarce dictionary that is rarely offered for sale. First edition. Printed and Published at the "Daily Press" Office. Hongkong. 1866. William Lobscheid, a German medical missionary and printer, served in Hong Kong and Guangdong Province for just over 20 years. Lobscheid originally came to China as a member of the Rhenish (Barmen) Mission in 1848. Linguistically extremely able Lobscheid learnt Chinese while in Hong Kong and was soon helping Karl Gutzlaff in his work to open China to Christianity. At the beginning of the 1850s he resigned from the Rhenish Mission, returning to London to further his medical training and experience. It was at that time that the young Hudson Taylor having read Lobscheid's reports travelled to London to meet him. Lobscheid was a great influence on Taylor, and also became his Chinese language teacher during their four month long voyage to China. 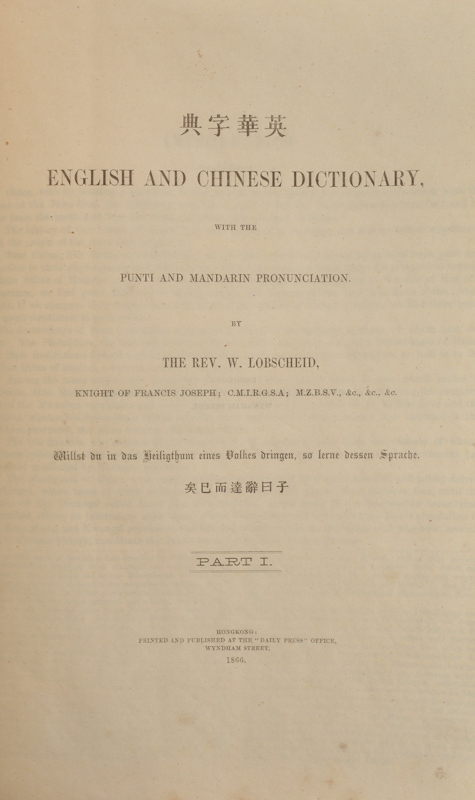 In 1852, Lobscheid became the first medical agent of the Chinese Evangelization Society (CES). Although based in Hong Kong he spent a great deal of time among the local people in eastern Guangdong Province. His medical skills enabled him to travel in areas where no European had previously visited and offered him an access to the ordinary Chinese person which was rare. He was one of the first Protestant missionaries to live outside the treaty ports however his adventures in these areas were not always happy experiences, at times being the victim of robbery or the wrath of angry mobs. After falling out with the CES, in 1870, he left Hong Kong for the United States where he spent the remainder of his life. (Laura Mason - Biographical Dictionary of Chinese Christianity). Just as Gutzlaff did, Lobscheid believed in the importance of printing in his efforts to spread the Christian message and to disseminate western medical knowledge. His efforts with the printed word were not limited to the supervision of printing his revision of Medhurst's translation of the Bible into colloquial Chinese but included original work such as this comprehensive dictionary, Chinese grammars and booklets on a variety of topics such as: "The Evils of Hongkong and their Cure", "The Religion of the Dayaks" (on Taiwan), and another on the likelihood (which he did not believe to be high) of Chinese successfully living in American society entitled: "The Chinese; what they are, and what they are doing". The Chinese text 子曰辭達而已矣 on the upper cover of each of the four volumes translates as "Confucius says, language should be intelligible and nothing more" a rather interesting choice of quote for a linguist of Lobscheid's ability, but one which perhaps tells us something of Lobscheid's attitude to language education for the broader populace. Cordier 1602.